On average, you should have your septic tank pumped every 3-4 years. We offer convenient hydrovac truck services for non-destructive excavation. We offer portable toilet and washing station rentals by the day, week or month. We offer power snaking/drain cleaning services, frozen pipe unthawing and more. 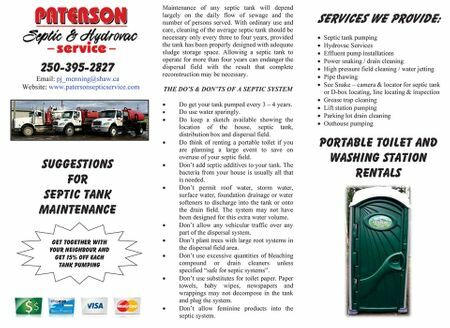 Paterson Septic & Hydrovac Service provides septic tank pumping, power snaking, septic repairs, septic supplies, portable toilet rentals, pipe thawing, hydrovac services and much more throughout 100 Mile House and the surrounding area. Paterson has been owned and operated by the Menning family since 1998 and has operated in the 100 Mile area for over 20 years. Open 7 days a week, call for an appointment.